Pojo's Pokemon Card Reviews, news, tips, strategies and more! Pick Up Our New 20th Anniversary Pokemon Book for your Collection! 1 being horrible. 3 ... average. 5 is awesome. Golisopod (SM: Guardians Rising 9/145) is our final subject this week, and also the last runner-up from our Top 15 countdown: if we count out this far, it would be our 31st place pick. Technically, there is one more card for the countdown… but it is just Phantump (SM: Guardians Rising 6/145), only notable for giving Trevenant (mainly XY 55/146 and SM: Guardians Rising 7/145) another way to quickly hit the field. I should have just combined it with our review of Trevenant (SM: Guardians Rising 7/145), which was our 15th place finisher. So with that out of the way, onto Golisopod! Golisopod is a Grass-Type, but what does that mean? In terms of striking Weakness, many Fighting- and Water-Type Pokémon qualify; on the other hand, no Grass Resistance is found on anything not restricted to the Unlimited Format. Grass-Type is famous for Forest of Giant Plants, but technically that cares about the Type of Wimpod, not Golisopod; I’ll mention already that Wimpod is a Grass-Type, so Forest of Giant Plants can help. Revitalizer is also a nice option, but a bit less special now that players have Rescue Stretcher; run an Item to add two Grass-Types from discard pile to hand, or run an Item to add any one Pokémon from the discard pile to hand or shuffle three from the discard pile to deck? Otherwise, there cards like Herbal Energy saw next-to-no competitive play and are now Expanded only. There are anti-Grass-Type effects, like Parallel City, but even then Parallel City is used mostly for its Bench-shrinking effect; nothing especially fatal. The Grass-Type has both good attackers like Lurantis-GX and strong Bench-sitters like Decidueye-GX and Vileplume (XY: Ancient Origins 3/98), so there’s decent stable from which to draw support if you make this card’s Type the deck focus. As a Stage 1, Golisopod is a bit slower… unless you use Forest of Giant Plants, of course. Even with that super-shortcut, you’ll need to run two cards for each Golisopod you want to hit the field, so Basic Pokémon still enjoy that edge. Golisopod has 130 HP and surprise! We’re going to bring up the Ability because it is clearly relevant here. “Armor” reduces the damage this Pokémon takes from attacks, after Weakness and Resistance are applied. Without this Ability, Golisopod is a probable OHKO for most competitive decks; not all decks be able to do so rapidly, reliably, or repeatedly, but two of the three are likely. One issue is that the Stage 2 Pokémon-GX which have proven competitive have forced 2HKO strategies to strive for a 120 damage and 130 damage pairing over two turns, or just 130 damage per turn to play it safe. Before this, unless you were worried about stuff like Wailord-EX, you just needed to hit 120 per turn to take down even the largest Mega Evolutions (barring additional defensive buffs) as they maxed out at 240. That extra 30 points of damage absorption means a Type-neutral attacker (not hitting Weakness or Resistance) needs 160 in one shot, a bit of an awkward amount. Decks that hit it tend to hit hard enough they already were scoring OHKO’s against 170+ HP Pokémon, or fall just a bit short as they go for the reliable 2HKO or even less conventional approaches (like control or mill). Another added bonus is that unlike more HP, Armor applies turn after turn; your opponent needs 160 for a OHKO, but 190 (over two turns) for a 2HKO, 220 for a 3HKO, etc. Small, technical attacks that still do damage but are mostly used for their effect? That damage may be totally absorbed. So what about when Weakness is factored in? Fire Weakness is not a good thing to have right now, as Volcanion-EX decks are still effective and fairly popular. The good news is that Armor is still reducing damage, but as it is after Weakness, any Fire-Type attacker that hits for 40+ damage will still hit harder after Weakness and Armor are applied. Possibly a silver-lining is the decks most likely to hit for Weakness were likely already capable of OHKO’s; Fire-Type attackers will just save on some resources, instead of achieving a OHKO they normally couldn’t. No Resistance is typical, so I’m usually just venting when I bother bringing it up, but Armor would have made Resistance even more effective, as even when it is only against a single Type, -50 damage (-20 for hypothetical Resistance plus -30 for Armor) shuts down small attacks, turns medium attacks into small attacks, large attacks into medium attacks, etc. The Retreat Cost of [CC] is mediocre; it is low enough you can probably afford to actually pay it, with a decent chance of recovering from the lost Energy if the game progresses long enough, but it isn’t something you’ll want to avoid if possible, especially because doing so more than once is definitely not affordable. 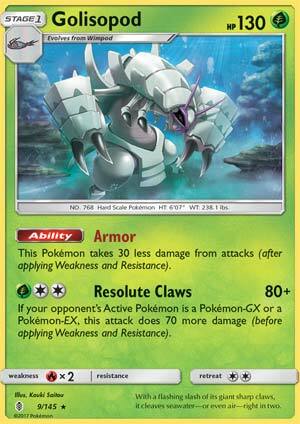 We already covered the Ability, so now we’ll cover the one attack found on Golisopod: “Resolute Claws” costs [GCC] and does 80 damage, plus another 70 if the Defending Pokémon is a Pokémon-EX or Pokémon-GX. Though not overly affordable, three Energy just needs a little acceleration to be readied in two or even one turn as opposed to three; Double Colorless Energy is an obvious choice, and Max Elixir might be worth considering as well, depending upon the deck. 80 for three is decent, but 150 for three is brilliant, even if only against Pokémon-EX and Pokémon-GX. Almost everything in the game should - at worst - be a 2HKO for Golisopod, and with Choice Band and/or Professor Kukui you’ll threaten to OHKO valuable targets like Basic Pokémon-EX and Pokémon-GX. Grass Weakness pops up often enough to also matter, if not now, then most likely in the long run. Putting it all together, we get a good - though not great - Stage 1 attacker with above-average durability. So what else do we need to discuss? Well, we already know that Wimpod is this card’s Basic, and the only version available right now is SM: Guardians Rising 8/145). I already pointed out it was a Grass-Type, so Forest of Giant Plants allows you to immediately Evolve it, which is good. If you don’t, you’re left with a 70 HP (decent) Basic that has Fire Weakness (still dangerous), no Resistance (still “meh”), and a Retreat Cost of [CC] (worse on a Basic). It has two attacks (Abilities are more promising), but at least the first only requires [C] and the second only requires [G]. Then again, you get what you pay for: the first is just “Scamper Away”, allowing you to shuffle itself and all cards attached back into your deck, while the second is “Ram” doing 10 damage. Maybe we’ll have some combo in the future that makes use of Scamper Away, but Ram is pure filler. So, back when we were making our lists, there was a decent amount of buzz around Golisopod; it looked like it might become the new main attacker in Decidueye-GX/Vileplume builds. With “Feather Arrow” augmenting the damage output and “Irritating Pollen” blocking Items, the Fire Weakness on Golisopod seemed like the only chink in its… wel… armor. So where is it now? Crowded out by the competition, methinks. The hype occurred while Decidueye-GX/Vileplume was the deck to beat, and as such, were disproportionately numerous at tournaments. They are still something you might see in the Top 8, but now it is probably just one or two. This means the other alternate attackers like Alolan Ninetales-GX or Trevenant (SM: Guardians Rising 7/145) or a few others are fighting over a lot less real estate. Then consider what seems to have replaced Decidueye-GX/Vileplume; multiple different decks backed or even focused on using single-Prize attackers with the raw offensive might to OHKO Golisopod (and sometimes even Decidueye-GX). Only with the help of Feather Arrow is Golisopod scoring a OHKO against Vespiquen (XY: Ancient Origins 10/98), and it is one of the smaller single-Prize attackers of which I speak. So are things over before they really began for Golisopod? No. It reminds me a bit of Bouffalant (BW: Dragons Exalted 110/124); indeed that card was a Basic Pokémon with an Ability that reduced the damage it took and an attack that hit Pokémon-EX hard. It had its ups and downs as the format progressed, and Golisopod might manage the same; if we get back to being dominated by Pokémon-EX/Pokémon-GX, it could become a star. Even if we don’t, it might just be waiting for better dance partners. So don’t forget it in Standard or Expanded, maybe even experiment a little with it, and enjoy it in Limited play, where just about everything about it becomes better due to the lack of competition and the need to mix Types. Golisopod is another card released about an expansion too late; we’d probably have been sick of it had it been in Sun & Moon. It still holds quite a bit of promise, and I’m surprised it doesn’t seem to be showing up at all at major tournaments, though my data on the matter has a lot of gaps (I’m focused on Masters, and I don’t have full decklists). Like I said, don’t forget about it and even try it out every now and again; it is probably just waiting for another Pokémon-EX/Pokémon-GX flooded metagame. Golisopod earned one more voting point than the Phantump I mentioned we won’t be giving its own review, and one less than Dhelmise and Whimsicott (SM: Guardians Rising 91/145). It didn’t make my own Top 20, but only by a few places, as it was my 24th place pick. I wish I could say that was me seeing how the metagame was about to shift, but it was mostly due to overestimating several other cards; I expected more from this card even though it didn’t make my own Top 20. Hello readers! Vince here bringing you some commentary of Pokemon Card of the Day from Pojo.com. Today, we’re looking at Golisopod from the Guardians Rising set. I remember encountering Golisopod in several battles, mostly under the control of Team Skull Guzma. First Impression did ridiculous damage to my in-game team! Even worse, Golisopod can switch out via Emergency Exit if it's HP is in trouble......so that it can use First Impression again. I had to do soft resets and some team repositioning. Since this Pokémon is ridiculous in the games, how ridiculous is it in the TCG of that particular card? Well, Golisopod is a Stage 1 Grass Pokémon with 130 HP, weak to fire, and has a retreat cost of two. Not bad! But then we get to abilities and attacks. Armor reduces all forms of damage to Golisopod (except placing damage counters) by 30! If there was some attacks that forces damage to one of your Pokémon, then you can direct it to Golisopod. For example, Zapdos's Raging Thunder does 120, but forces one of your Pokémon to take 40. Directing it to Golisopod makes it take 10 instead because of Armor ability. Reducing the damage by 30 means that opponent will have to work harder to achieve 160 for an OHKO, 110 for 2HKOs, 80 for 3HKOs, and the like. This would be the improved version of Bouffalant (BW Dragons Exalted). Speaking of that card, why don't we start comparing Golisopod and Bouffalant since it did a similar job at the time of the rotation? Bouffalant is a Basic Pokémon with 100 HP, weak to fighting, and retreat cost of CC. It's ability, Bouffer, reduces any damage by 20. Golisopod's Armor reduces it by 30, tanking 10 more damage. And with more HP makes Golisopod bulkier than Bouffalant. Its attack is also similar, Gold Breaker costs CCC and does 60 plus 60 if the defending Pokémon is an EX; Resolute Claw cost GCC and does 80 plus 70 if the defending Pokémon is an EX or GX. It is worth noting that Resolute Claw can OHKO Wailord-EX even with Fighting Fury Belt since with the effect and weakness, it will deal 300 damage [(80+70)x2] (before factoring boosting item cards) (unless Parallel City reduces damage by 20, making it 280, in which Wailord-EX backed with FFB will still survive with 10 HP left). Both Pokémon also had methods to do more hate to EXs/GXs: Silver Bangle was for Bouffalant at the time, while Choice Band is for Golisopod. So, it seems that Golisopod can tank and hit far harder than Bouffalant, but since you need an evolving basic, it might cost some deck space while Bouffalant is fast to the field being a basic. Golisopod's attack cost isn't splashable, either, since one of them has to be at least one grass energy. However, Bouffalant is a bit outdated because there weren't any GXs at the time, Golisopod covers both EX and GX Pokemon. So overall, Golisopod is a nice addition to the army of Pokemon cards that brings the opposition to EXs and GXs that are frequently used in decks. And Forest of Giant Plants will ensure that Golisopod will be in play instantly without worrying about dealing with Wimpod’s low HP and/or contributions. If you’re around an area where players have EXs/GXs, give this card a try! Notes: Golisopod is a solid Pokémon that does the job far better than Bouffalant. And thanks to Forest of Giant Plants, it doesn't have to worry about speed issues. I am glad this Pokémon has a familiar concept that the card developers wished to keep and continue using. I guess the fire weakness and that Armor can be shut down by ability lock keeps the card from being amazing. July 5, 2017 Note: "So FIRST of all, it's been brought to my attention that I'm actually terrible at using Aether Paradise Conservation Area because I can't read! It only affects Basics and NOT Evolution Pokemon, as advertised in the Golisopod review from last week, so Armor is Golisopod's only real means of lowering the damage done to it. This does impact its survivability, and therefore it would reduce my rating by a half-point on all its format categories. Thanks go out to the avid reader(s) who catch my mistake and don't take my advice at face value, because even reviewers can make basic reading mistakes! Trust me, it's not the first time this has happened to me, and I'd like to apologize for this embarrassing habit I've imposed on myself because I forget to read words like "Basic"." This is what I get for just assuming all Stadiums work the same! Ahhh, Golisopod, you're such an interesting Pokemon, BUT GOSH DANG ARE YOU A PAIN TO CATCH!! At least you don't have to worry about scuttling cards in the TCG, you can just grab whatever you want and bring it in. Golisopod evolves from Whimpod, who for some reason has to attack in order to retreat and has a much higher Retreat Cost than something that runs away the moment you so much as TOUCH it should. But hey, this thing's hard enough to catch, so maybe it's worth it? Indeed, Golisopod may actually be worth it. His only attack is Resolute Claws, a 3-for-80 move that deals an extra 70 damage if they're an EX or GX. That means that, for the most part, he can 2HKO any Pokemon in the game - most non-EX/GX cap out at around 150 HP anyway, and no EX/GX has more than 250 HP, which means Golisopod can definitely dish out a lot of damage! Couple that with the extra boost you could gain from something like Choice Band, and Golisopod looks like a strong contender. That aside though, he only has 130 HP, so what keeps him in-play long enough to 2HKO most things? Well to start, there's his Ability, Armor, which shaves off 30 damage from all incoming attacks. It may not help as much against Fire-types, since it applies the reduction AFTER Weakness/Resistance, but against most anything else, this is a strong defensive counter. Now players will need around 160+ damage to OHKO Golisopod, and they can't take advantage of Choice Band's damage boost since Golisopod isn't an EX/GX! Another thought to add onto the damage reduction is through Aether Paradise Conservation Area - APCA? Conservation Area? how do you abbreviate this thing... - which further lowers the damage that Grass and Electric Pokemon take from attacks by 30! And hey, guess what, Golisopod falls right into that Grass category, meaning he could be tanking 60 damage off of a lot of attacks! That's definitely a lot to shave off, and it makes Golisopod that much sturdier against oncoming assaults or even counter-assaults! If I were going to play Golisopod, I'd probably run the APCA with him, though while it's around and about, I'd stick with Forest of Giant Plants and combine him with Decidueye-GX for the extra 20 damage per Ability - that way Golisopod can strike down a lot of opponents quickly if he needs to. It's one of those decks that's really nice in theory, but it requires a lot of set-up, and APCA can't provide the same utility that the Forest can in this case. Once Forest rotates out though, it might be better to stick with APCA and hope that another Grass-supportive Pokemon arrives to allow Golisopod to do his thing. After all, we don't wanna brick with all that extra stuff, do we? Will Golisopod/APCA become a strong deck in the future? Perhaps. There's a lot of room for it to grow, and looking into the future, there is supposed to be a GX for Golisopod on the way! We'll see if he's gonna be any good though, and if he is, will he work well alongside Golisopod or become a rivaling force on his own? Whatever the case, Golisopod is still very much a noteworthy contender. Arora Notealus: I suspect Golisopod's been overshadowed by the powerful GX and Garbodor that he may end up a sleeper hit. Be wary of this going forward, as he might make a dangerous contender down the road. Who knows what Grass-Weak GX may show up that will want to avoid the Golisopod? Weekend Thought: Sorry for being out most of this week, but hopefully you guys thought about some of this week's cards more than I did! Perhaps there are some strong contenders this week that you didn't think about before? Does the combination of Dhelmise and Metagross-GX intrigue you? Think there's something more to Whimsicott or Golisopod?